We are leading manufacturer and supplier of Cotton Candle Wicks. specialised Candle wicks for even burning of the designer candles. Size: 1", 3", 7" 2", 5", 9"
Candle wicks one of the most important factor for clean burning of the candle, we deal in wicks of varius heights and quality to suit your candle. Custom made wicks can be manufactured on order as well. We provide the best quality wax coated wicks. Used for tea light candles, all types of floating candles and various other lighting purposes. Available in various sizes and as per customers requirment. Our company has earned accolades in providing Cotton Braided Wicks to the clients. Cotton Braided Wicks remain sustained for long time. These products are flexible and finely prepared by experts following best method and by using quality approved material. Offered range is light in weight and delivered timely. Our Cotton Wicks are widely appreciated for uniform braiding and finishing. These wicks are made up of high quality cotton fibers in comply with the industrial standard. In addition, these are available in flat and round shapes in the market. 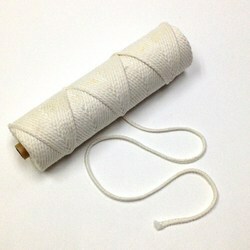 Our cotton wicks are used in religious occasions and also in manufacturing candle wicking. maximum 150 jyots in a packet @ Rs 30 / doz.